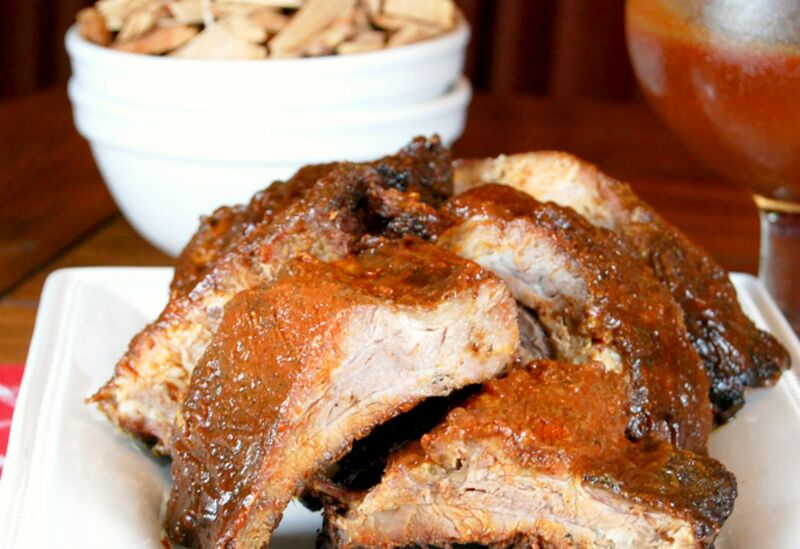 Our Barbecued Smoked Ribs Are Dry Rubbed, Smoked over Hickory Chips, Then Sauced With Our Homemade Bourbon Barbecue Sauce! Now, These Are Good Eating! You know you have a really KILLER recipe when you go back to it time and time again for over 11 years. I mean Come ON! Well, this little recipe here is one of those. These are my all time favorite ribs! I LOVE everything about them. They have a delicious rub. They’re smoked slowly. Then, if all that love wasn’t enough, they’re slathered in some deliciously sweet, happily spiked, all-time yummy, barbecue sauce! 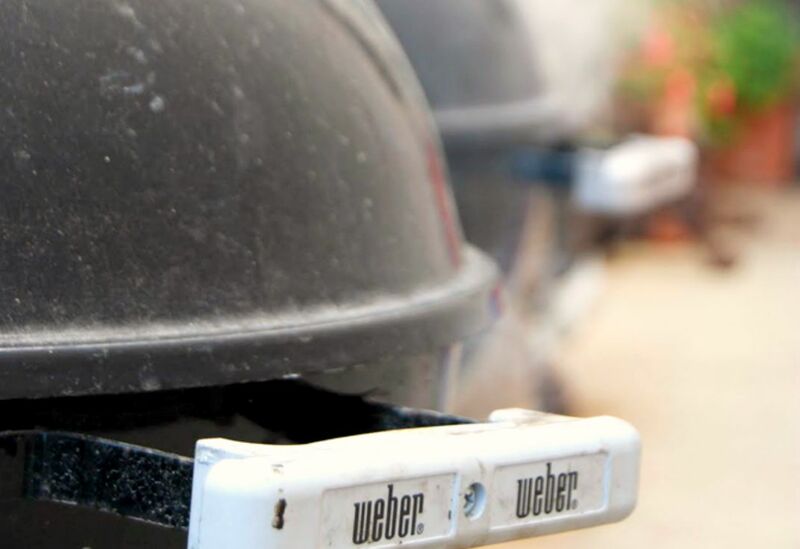 As soon as the weather just begins to warm up, my whole family knows the Weber will be making its first debut and soon we will be feasting on some lip-smacking ribs. The recipe is originally from Bon Appetit, July 2000. Over the 11 years I’ve been making these I’ve made very few changes. The original recipe calls for 6 racks of ribs. I use the 3 pack I get from Costco. I make the rub just as it was originally written. For me, it works perfectly for the 3 racks. The sauce I generally make also as written and always have LOTS left over. This is ultimately a really good thing for me because I love this bbq sauce. I use it on absolutely everything from bbq chicken to roast beef and smoked cheddar paninis. Now, if you’re in the more vinegary bbq sauce camp, this is NOT the bbq sauce for you. This is a yummy SWEET sauce that doesn’t even call for a drop of vinegar. Feel free to sub out for your own favorite if you’re a vinegary sauce lover. Okay, there are a few gadgets that make smoking these babies a whole lot easier. First is the Weber Char-Basket briquet holders. This holds the charcoals anywhere you want them in neat little baskets. In this case, I place them on opposite sides of my Weber. This creates what is referred to as a 2-zone, or direct and indirect heating zones. The second thing that you might want to consider investing in, is a Grate that has hinges. My 22 inch Weber didn’t come with this, but for me, this purchase was a no brainer. Probably because the first time I made these, I had the standard grate and I thought it was a ginormous pain to lift the ribs off and then the grate as written if step 7. 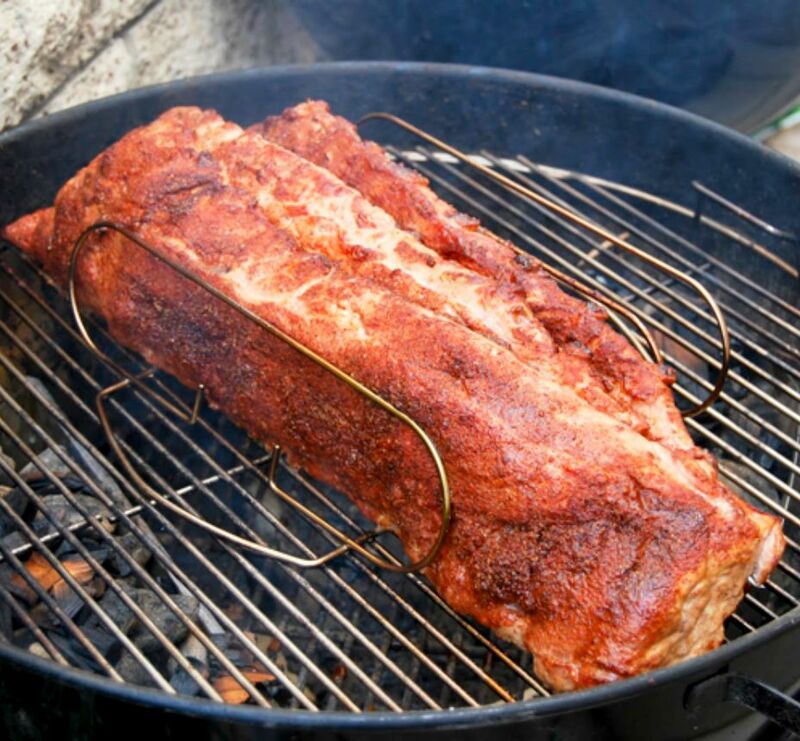 Also, when I’m smoking more than one rack of ribs at a time, I like to use Rib Rack . This ingenious little tool allows you to place multiple racks on the same grate space that without the rack you’d only have space for one! Anyway, these things are obviously not required, but I just wanted to share with you what works for me and makes my life a whole lot easier! Lastly, if you think the whole smoking thing sounds like a royal pain, these ribs are seriously delicious just plain ole baked! Of course, they don’t have quite as much smoky yumminess, but they are still honestly killer delish! Mix all rub ingredients in a small bowl and set aside. Sprinkle an even portion of rub mixture on both sides of all racks of ribs. Rub into ribs. Let stand 1 hour. Place wood chips in medium bowl. Pour beer or water over them and let stand 1 hour. Place handful of torn newspaper in the lower chamber of a Chimney Starter. Top newspaper, in the upper chamber of the chimney stare with 25 charcoal briquettes. (I've never counted! I just fill the chimney up as far as I can). Remove upper rack (grill) from barbecue and place chimney starter on lower grill rack. Light newspaper and let charcoal burn until ash is gray about 30 minutes. Open 1 bottom grill vent. Turn out hot charcoal into two Weber Char-Basket briquet holders on either side of the lower rack. Remove 1 cup wood chips from beer and drain (keep remaining chips in beer). Scatter drained chips over coals (avoid using too many wet chips, which may douse the fire). Place upper grill rack back on barbecue. Arrange ribs on upper grill rack in a rib rack. Cover barbecue with lid, positioning top vent directly over ribs. Place stem of candy thermometer through top vent, with gauge on the outside of lid and tip near ribs (thermometer should not touch meat or grill rack); leave in place during cooking. Once thermometer is properly placed, check temperature after 5 minutes. Open and or close top and bottom vents to maintain a temperature between 275°F and 325°F. (Opening vents wider to increase heat and closing to decrease heat.) Leave any other vents closed. If, and/or when, temperature of barbecue falls below 275°F, use oven mitts to lift off upper rack with ribs; place rack with ribs on heatproof surface. Using tongs, add hot gray charcoal from chimney to bottom rack. Drain remaining 1 cup wood chips; sprinkle over charcoal. Reposition upper rack on barbecue, placing ribs above loaf pan. Cover with lid. Grill until ribs are very tender and meat pulls away from bones, about 45 minutes longer, brushing with 3/4 cup Bourbon Barbecue Sauce the last 15 minutes of cooking. Follow above instructions for sauce, rub, and rib preparation. Bake ribs for 2 1/2 hours on a cookie sheet. Remove ribs from oven and cover generously with bbq sauce. Broil ribs on both sides just until sauce glazes nicely. BBQ Meatballs – Tender, delicious meatballs smothered in a delicious, sweet homemade BBQ sauce. Previous RecipeBlueberry Lemon Cream Bars-Creamy Crunchy and Loaded With Blueberries! Next RecipeBourbon Brownies with Double Frosting!!! Now you're talkin' my language! Those look great! It's hard to be freshly smoked ribs isn't it? Makes it hard to enjoy the ones you get at a restaurant once you've made your own. There's nothing quite like a good slab of ribs. This recipe looks amazing, thanks for sharing! These look amazing! Smoked too… Delicious! Thanks for sharing your recipe… Wish I could have some right now! I haven't tried smoking. Sounds like I'd better start. The ribs look irresistible. Wow, seriously! I wish we had a charcoal grill. I'm making the rub the next time we have ribs, which should be very soon. Now I'm craving ribs for dinner…these look so good! I wish I could share a rack with you! I hope you have a wonderful day, my sweet friend. Thank you for sharing another creative and beautiful dish. Hugs from Austin! Oh my! This looks marvelous, Kathleen! I'm passing this on to my BIL…I'll let him do the smoking! mmm, just mouthwatering, i love ribs! Love any kind of country ribs but your version and recipe looks amazing! Finger-licking good! I need seconds please! Looks great – perfect summer recipe! I can never have enough rib recipes. Those ribs look so amazing! I'm not even a big fan of ribs and you are making me crave some BBQ now.